Should my hospital focus more on improving its mortality rate? Which pharmacists are handing out too many opioids? What they both have in common is that there's a right way and a wrong way to do them. Further, it's very easy to answer these questions the wrong way and have your mistakes go unnoticed. As you'll see, the difference between great and average answers to these questions is a having a little bit of a mathematical background. The Centers for Medicare & Medicaid Services (CMS) is responsible for rating hospitals based off of quality and performance metrics. They provide various metrics to estimate hospital performance and one overarching metric known as the quality_rating. Another less important rating is the mortality_rate. As you can see, each row represents a hospital. Each hospital has a mortality rate and quality score. 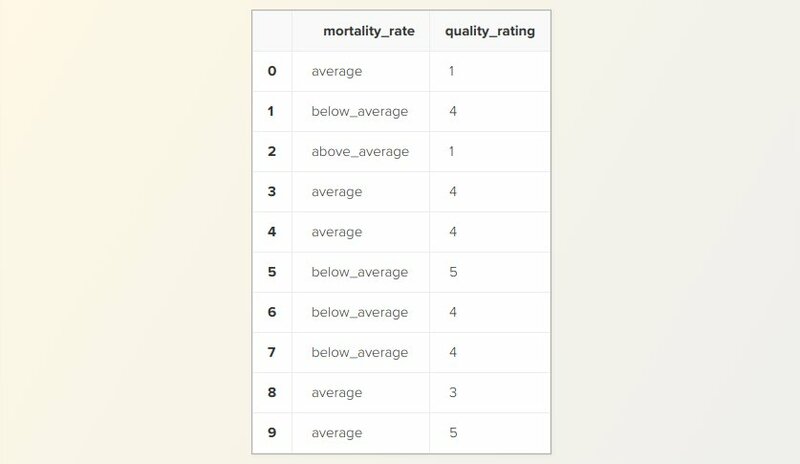 The premise is to compare mortality_rate and quality_rating so a key statistical tool should be jumping to your head. Correlation. What's the correlation between these two metrics? Did you arrive at a solution? Lets walk through this together. There are arguably two steps remaining in this problem. First, we should note that our mortality_ratecolumn contains ordinal data. We can only perform correlation on numerical data so we'll have to do something about this. Let's encode our data in some way that preserves its ordinal relationship. In other words, we want to our encoding for below average mortality_rate to be numerically superior to our encoding for above average mortality_rate (Note that a hospital having a lower mortality rate is better). I'll explain why in a bit. But for now, let’s just continue with mapping to last option: mapping to the set: (-1, 0, 1). The last step to this problem is (deceptively) the simplest. Now we just need to correlate our two columns right? Not quite. We've made a huge assumption about our data. We've assumed that our data was anything more than ordinal. As a data scientist, you should be familiar with the concept of parametric and non-parametricstatistics. Most statistical correlations will default to a parametric correlation method known as pearson. In our case, we need to use a non-parametric correlation known as spearman. This non-parametric method assumes that our data is nothing more than ordinal. In other words, no matter what mapping we make, the spearman correlation will return the same result — so long as the order is preserved after mapping. We've just dropped the correlation by about 10%. That's a drastic difference! Had you reported this correlation using pearson as opposed to spearman, you might have seriously mislead a customer or coworker. This goes to show that having a strong statistical background is essential for the data science role. Such a deceptively simple problem had a key mathematical step that's often overlooked. 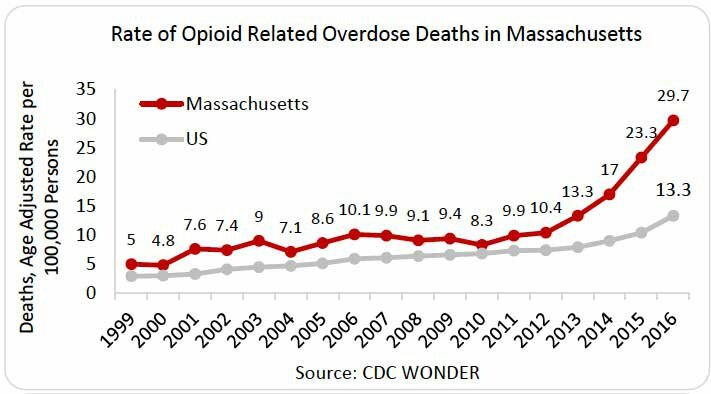 You have millions of pharmaceutical records for the past 5 years in Massachusetts, a state well known for its opioid abuse problem. For this reason, it would be very useful if you could identify pharmacists who are prescribing too many opioids. Generate a list of pharmacists who are overprescribing opioids. The first thing we should note is that prescriber_id does not contain unique values as prescribers may have prescribed drugs over multiple days. Since this metric is on a prescriber level — not a daily level — we should fix that with a pandas groupby. Much better. Now the task at hand is to rank prescribers on the basis of how many opioids they prescribe. But prescribers prescribe different amounts of drugs. This hints that we should now take each prescriber's opioid prescription ratio. Let's do just that. Pandas made that extremely easy. So we're done right? Just sort the prescribers by opioid_ratio and tie this task off? Not quite. This data should raise some red flags for you. Because we don't have enough information to judge them. Imagine you were sitting in a pharmacy watching a pharmacist (let's call them "Bill") perform their job. Suppose you want to report Bill if he prescribes too many opioids. A customer walks in and Bill prescribes them hydrocodone (a common opioid). It'd be silly to report Bill immediately for this. You'd want to wait and see more of Bill's actions before you judged him because you're not confident in your findings yet. Confidence is a key word here as we'll soon find out. Statistically speaking, prescribing an opioid or not can be though of as a Bernouli parameter (a fancy term for something that's binary in value — either true or false). And given the number of observations of a bernoulli parameter, we want to predict this parameter's true value. By "true value" I mean the actual value that prescriber's opioid_prescription_ratio would converge to if we had enough observations. The "true value" in our example with Bill would be equivalent to Bill's opioid_prescription_ratio if we were able to watch and record his actions for a very long time — like a year. 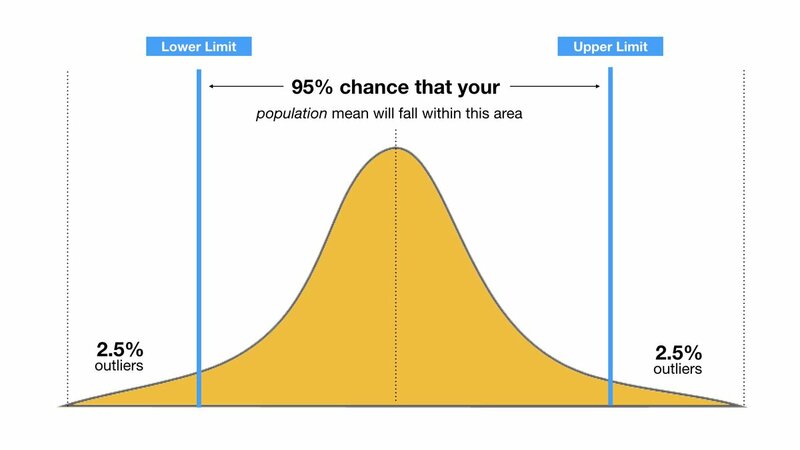 If you've taken a statistics or good data science course you're probably familiar with the concept of confidence intervals. If not, in simplest terms, a confidence interval is just a measure of mathematical confidence attached to a range that you believe an unknown value exists within. Source: Who needs backup dancers when you can have confidence intervals? For example, I could be 95% confident that tomorrow's temperature will fall between 40 Fahrenheit and 70 Fahrenheit. In 1927 mathematician Edwin Wilson applied the concept of confidence intervals to Bernoulli parameters. 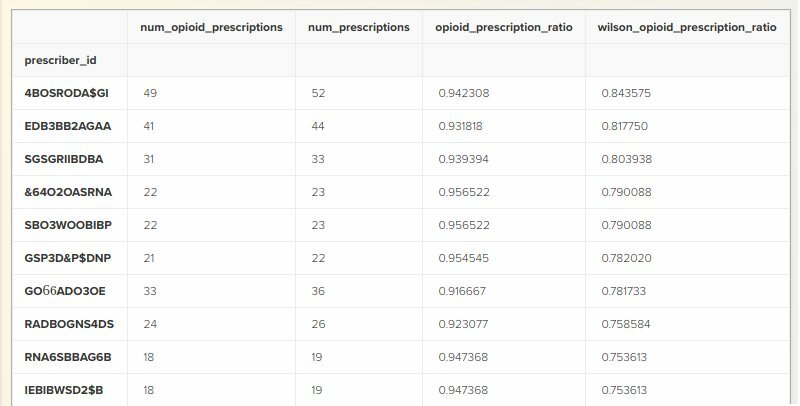 This means we can guess the true value of a pharmacists opioid_prescription_ratio given the amount of data we have on them! The formula looks intimidating but it's intuitive if you take the time to walk through it. Explaining the mathematics behind why this formula works is worth an entire discussion itself and is thus out of scope. So we'll just focus on applying it below. Amazing! Now these are the results we would want to report. 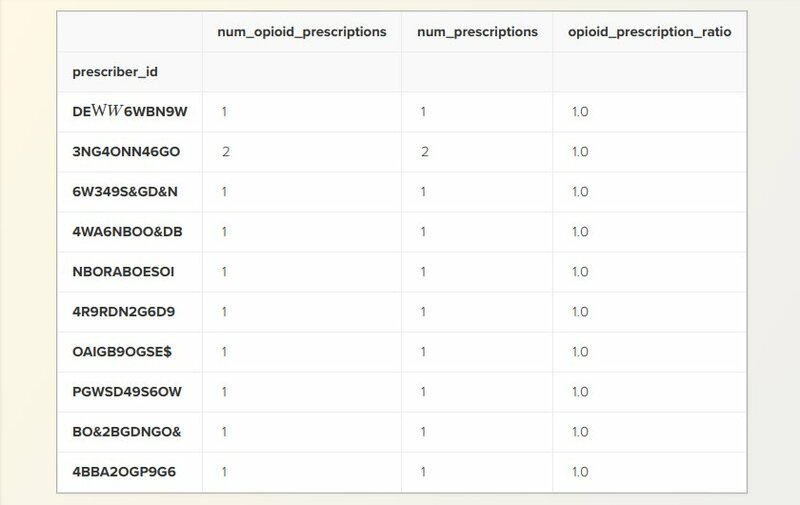 While there are plenty of prescribers with 1/1 or 2/2 opioid prescriptions, they now appear at the bottom of our rankings – which is intuitive. While our highest ranking prescribers have a lower opioid_prescription_ratio than some other prescribers, the rankings now take into account a notion of mathematical confidence. Both approaches to this problem — with or without using confidence intervals — are technically acceptable. However, it's easy to see that approaching the problem with a mathematical background yielded much more valuable results. A large part of the data science job is translating open and interpretable questions into quantitative, rigorous terms. As both of these examples have demonstrated, sometimes it’s not such an easy task and many data scientists often fall short in this regard. It’s very easy to fall into the trap of using parametric correlation in a non-parametric scenario. And it’s very easy to naively sort a list of Bernoulli trials without taking into account the number of observations for each trial. In fact, it happens more often than you’d think in practice. Part of what separates a good data scientist from a great data scientist is having the mathematical background and intuition to identify and act upon situations like this. Often times what can make the difference between a solution and a great solution in data science is leveraging the right mathematical tools in the right context. Bio: Brian Joseph studied mathematics at Northeastern University, with a research focus in combinatorics and linear algebra. Currently working as a data scientist for a start-up in the greater Boston area with a passion for mathematics, data science, formal verification, and algorithm design.